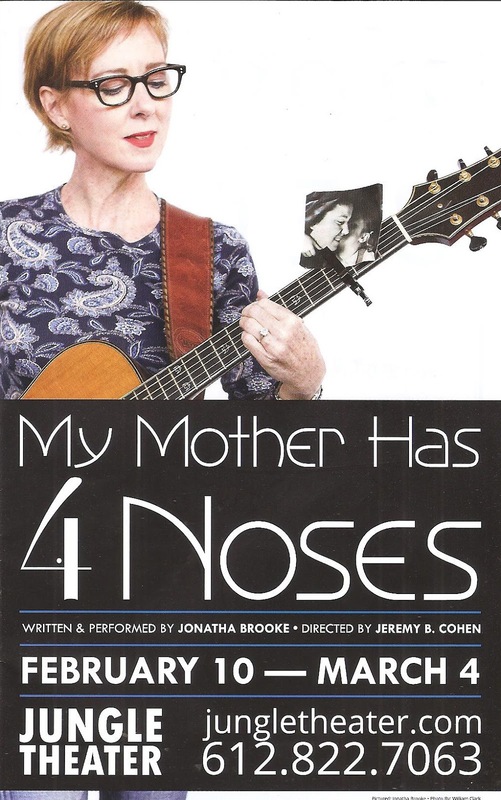 You might think the title is an analogy for something, as I did, but Jonatha's mother literally had four prosthetic noses that she wore to cover her lack of a nose due to cancer. A cancer that grew for 20 year's because Jonatha's mother (who went by many names, so let's just call her Mom) was a Christian Scientist, a religion that preaches "sickness is an illusion that can be corrected by prayer alone." Jonatha has a lot to say about that in her show, but that's not all she talks about. In a series of stories interspersed with songs that, if you didn't know what they were about, you might not know what they were about (by which I mean they're not super literal about this situation, with emotions and themes that could be speak to different situations for different listeners, which is how you know they're good), Jonatha paints a picture of not just her mother's illness, but her life. Her poetry, her wacky sense of humor, her independence, her love for her family. In some ways this is a two-woman show, because Mom is very much alive on that stage. The play with music is well-constructed (and clearly and emotionally directed by the Playwrights' Center's Jeremy B. Cohen), leading us more or less chronologically through Mom's life, with a few detours. Projections of chapter titles help delineate the stories, while actual photos from the stories being conveyed help make them feel more real. Because of course, they are. As I wiped away tears throughout much of the show, I couldn't help wonder how Jonatha is able to bear reliving her mother's death every night. Perhaps it's cathartic, and perhaps it's worth it to keep Mom alive and share her irrepressible spirit with those of us who weren't lucky enough to know her. Jonatha accompanies herself on piano and guitar, with support from Rebecca Arons on cello and Sean Driscoll on guitar to fill out the sound of her original folk-rock songs. Just the spoken stories alone would do the trick, but the addition of these beautiful heart-felt songs add much emotional impact, allowing the show to really reach inside in the way that mere words cannot. 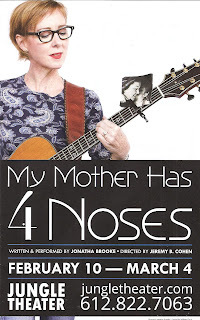 The funny, heart-breaking, beautiful experience that is My Mother Has 4 Noses continues through March 4.